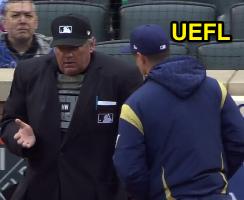 HP Umpire Hunter Wendelstedt ejected Brewers Manager Craig Counsell (strike three call; QOCN) in the top of the 5th inning of the Brewers-Mets game. With one out and one on (R2), Brewers batter Jett Bandy took a 3-2 sinker from Mets pitcher Noah Syndergaard for a called third strike, the only called strike of the at bat. Replays indicate the pitch was located over the heart of home plate and below the hollow of the knee (px 0.077, pz 1.460 [sz_bot 1.627 / MOE 1.544], the call was incorrect. * At the time of the ejection, the Mets were leading, 1-0. The Mets ultimately won the contest, 3-2. This is Hunter Wendelstedt (42 )'s fifth ejection of 2018. Hunter Wendelstedt now has 7 points in the UEFL Standings (9 Prev + 2 MLB - 4 Incorrect Call = 7). Crew Chief Larry Vanover now has 8 points in Crew Division (8 Previous + 0 Incorrect Call = 8). *The 3-2 pitch was located 1.008 vertical inches from being deemed a correct call. This is the 21st ejection of the 2018 MLB regular season. This is the seventh Manager ejection of 2018. This is Milwaukee's 2nd ejection of 2018, 1st in the NL Central (MIL 2; CHC, CIN, PIT, STL 0). This is Craig Counsell's first ejection since July 18, 2017 (Mike Muchlinski; QOC = N [Balls/Strikes]). This is Hunter Wendelstedt's 5th ejection of 2018, 1st since April 11 (Tommy Kahnle; QOC = U [Fighting]).